We have been avid divers for more than three decades now, and can honestly say that we enjoy diving now as much if not more than we did 30 years ago. Certainly there are things we don’t do now that we once did and our approach to diving has changed a bit but that doesn’t take away from the enjoyment. And when we travel, we do take advantage of the perks — the “senior discounts” offered to the over-50 crowd. So what does an older diver need to be aware of and how can they continue in a sport they truly love? No matter your diving age, fitness is important. Just consider some of the activities you will need to do while diving. Can you do a surface swim in your equipment if you come up away from the boat? Can you physically get yourself into or out of the water before or after your dive? Could you help your buddy if they needed it? As we age our physical abilities decline and we may not exercise regularly or adequately. And like the rest of the country our waistline may be growing. Did you know that the average person gains about 3 pounds (1.4 kg) per decade starting at age 20? Being overweight may not itself be a restriction to diving but it may indicate a lack of physical fitness and certainly can put you at greater risk for cardiac incidents. Being overweight can also put you at risk for Type 2 diabetes (noninsulin-dependent diabetes). Diabetes is usually considered to be a contraindication to diving by Divers Alert Network (DAN). Is Age a Barrier to Physical Fitness? We commonly assume that the older we get, the less we will benefit from exercise. However researchers have found that when it comes to improving the strength or endurance of our muscles, age is not a barrier. The cause of age-related differences in fitness appears to be the cumulative effects of our lifestyle choices. We choose to do less, and our bodies adapt. No matter what your age, if you reverse this downward trend you will see that your physical fitness and health will improve compared with others of the same age. Maintain your activity level, and fitness becomes easier to keep over time. So how do we determine whether we are physically fit enough to do diving? Neal W. Pollock, the research director at DAN, in a 2007 article on fitness and diving, discussed measuring physical fitness by calculating aerobic capacity. Aerobic capacity testing is most commonly completed with treadmill running or stationary cycling. Pollock recommends that a diver be able to maintain a capacity of 10 MET (metabolic equivalent) or greater. A MET is the amount of energy being burned when a body is at rest, with the normal MET in a healthy population ranging from 5 to 25. A diver under relatively calm dive conditions can dive safely with a capacity of only 7 MET. But add in any challenges and that capacity might not be enough. For more information on assessing your physical fitness to dive, see Alex Brylske’s “Are You Fit to Dive” article in the September 2010 issue of Dive Training. Diseases of the heart and blood vessels are the leading cause of death in the United States and according to DAN one of the most common causes of fatal diving accidents. As we age the prevalence of cardiovascular diseases increases. From DAN’s 2008 Annual Diving Report it was reported that the 2006 collection of data included 75 scuba fatalities investigated by DAN. Of these cases, 38 percent were attributed to heart disease, with the majority of the victims being classified as overweight or obese by body mass index. Annual death rates for insured DAN members were stable during 2000-2006, with a mean of 16.4 deaths per 100,000 members. Fatality rates increased dramatically with age. Among divers 15-25 years of age, the fatality rate was less than 10 per 100,000 members but increased to 30 per 100,000 among divers 65 years of age and older. High blood pressure is another factor to consider in assessing your fitness to dive. The average 60-year-old American male has a blood pressure of 140/90; 120/70 is considered normal. Chronic hypertension is associated with damage to the heart, kidneys and an increased risk of stroke. Antihypertensive medications, however, can help reduce the risk of serious illness. Most antihypertensive medications are compatible with diving as long as the side effects experienced by the diver are minimal and their performance in the water is not significantly compromised. Physical activity on a regular basis will certainly help improve cardiovascular function. Make sure that you discuss any new physical program with your doctor before proceeding. As a photographer, one of the things I really notice with aging is the change in vision. My arms are no longer long enough for my gauges and seeing pygmy seahorses even with a viewfinder is more than difficult. As we get older, the closest point at which we can focus moves away from the eye about 0.4 inches (1 cm) per year. By the time we get into our 40s most people will be having some trouble reading. At this point the drug store reading glasses become our friend. Underwater you may be able to put your gauges on a retractable holder so you can pull them out to arm’s length or you may opt for corrective lenses in your mask. Several inexpensive options are available at your local dive store. These can include lens spots, lens bonded into your mask or even ones that adhere to your mask by water surface tension. And for spotting small stuff, we also carry an underwater magnifying glass. Did He Say Go Right or Left? As we age our hearing becomes less acute and for many of us this begins to affect our daily lives. The National Institutes of Health predicts that an estimated one-third of people in the United States between the ages of 65 and 75 and close to one-half of those older than 75 have some degree of hearing loss. In diving hearing loss can pose a problem, especially during the dive briefing. You can miss important information about direction, timing, depth, conditions and safety factors. There are a number of easy steps to overcome this. Be sure to inform the divemaster that you are hard of hearing and may need for him to speak up or repeat things. Always confirm the dive plan with your buddy before entering the water. As well as staying physically fit and maintaining a good diet, we can also alter our diving styles and locations as we age. Both of us enjoy a “slow” style of diving not only because we are photographers but also because it helps us to conserve air and actually allows us to see more critters. We now try to find those dive operations that don’t enforce staying with the divemaster in a larger group. Many live-aboard operations fit this style of diving by giving you and your buddy the freedom to set your own dive plan and having the added benefit of limited gear handling. If you are diving with a day operation, it is important that you make sure that they know you and your buddy may drop behind. As we have gotten older our choice of destinations has also altered. Places that offer good visibility, warmer waters, less current and easier shore access with shorter swims are more important to us now. We also have reduced the number of dives we do in a day. Our five-dives-a-day regime has given way to three or four dives, with more time for relaxing and socializing. Lighten the load. As we get older we lose strength and stamina. You can overcome this somewhat by reducing the weight of your dive gear. If your diving environments have shifted to less demanding conditions then you may not need a buoyancy compensator (BC) with as much lift capacity as before. Manufacturers have introduced many new styles that have reduced weight, are easier to carry and take up less space when traveling on a dive trip. Smaller fins can also help. Stiffer, longer fins may be a thing of the past. Instead, like us, you may opt for some shorter and lighter full-footed fins. They are easier to pack, easy to put on and take off and don’t require a huge amount of energy to pump. Lengthen your straps. Reduced flexibility comes with age. It gets harder to reach down and adjust those fins. Try looking for gear that makes it easier to deal with that lack of flexibility. Get fins that have large pull-tabs and that are easy to adjust. Look for options on wet suits that allow you to easily get into the suit — this may include extra zippers on the legs and arms. Grow your gauges. As mentioned earlier it may be getting harder to see those gauges. Look for gauges and watches that have larger dials and are intuitive to read. An easy-to-read gauge will reduce a lot of unnecessary anxiety when checking air supply and time. Roll your bags. Our bags seem to get heavier every year. Over the years we have reduced our footprint, lightened our load and added wheels. There are a number of choices out there today for wheeled duffels of all shapes and sizes. These bags make it a breeze for getting your dive gear from A to B. Keep the core warm. Studies have found that the body’s response to cold changes significantly over a lifetime, with older people less able to maintain their core temperature at a given cold exposure than young people. You can help overcome this by staying warm, before, during and after the dive. Make sure you have the proper clothing to keep you warm before getting suited up for the dive (a hat helps). 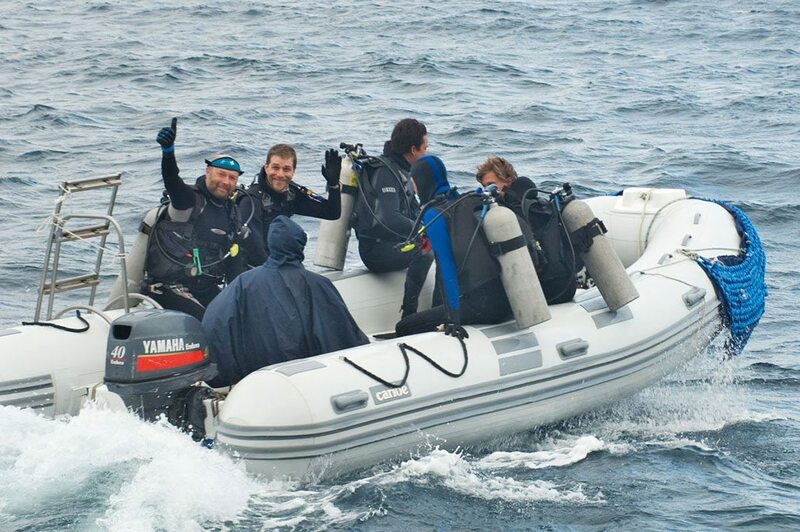 Make sure you have enough thermal protection to get you comfortably through the dive (a hood helps) and finally make sure you have clothes that will keep you warm after the dive. There are challenges to diving as you age but there are also a number of psychological and physical benefits associated with continuing to dive. Although diving may not be something that you do every day it can be an incentive to staying in good physical shape. And by being in good physical shape through regular aerobic activity such as walking, jogging, biking or swimming as well as muscle-strengthening exercises, we are more able to continue to perform the routine tasks of daily life. Stronger muscles also help to reduce the risk of falling and fracturing bones. Physical activity helps in reducing the risk of coronary heart disease as well as developing high blood pressure, colon cancer and diabetes. Studies have also indicated that physical activity is linked to improvements in positive psychological states such as confidence, well-being, mental energy and personal image. Although there is still much debate as to the reasons for these benefits, the overwhelming evidence supports the relationship between positive mental health and physical activity. Diving can also be a very social sport. It is a great way to travel and meet new friends. Participation in social activities as well as physical activity help to reduce the severity or chances of developing disorders such as anxiety and depression while reducing the deterioration of cognitive functions associated with aging. Your senior status may mean you actually have more time to devote to leisure activities like traveling and diving. Certainly diving can be enjoyed through your senior years. So stay active, eat healthy and get out there and dive.